Wishing everybody the most joyous Thanksgiving Holiday with those they love. I'm thankful for so much in my life that I can't think of anything I'm missing---so, I'm adding these to the list! I told you about how I ran back to the kitchen as soon as I could? Yeah, it didn’t go so well. That would have been too happy an ending, right? I found my first pudding a little too wet and coarse and I remembered writing about silky smooth pumpkin pie a few years ago (and mocking the fussiness of adding so many steps to a simple pie, that was, until I tried it) and decided to make it again with a couple of Cooks Illustrated’s suggestions, namely pureeing the squash in a food processor and cooking some of the water of of the squash on the stove before baking. I really liked the second version better, but since I always made it the lazy way before (and without complaint), I’ll explain where you can skip extra steps. But seriously, the extra steps really amp up the dreamy pudding-ness of the whole affair, and don’t take terribly long. The quickest method: In a medium bowl, whisk together all of the pudding ingredients. 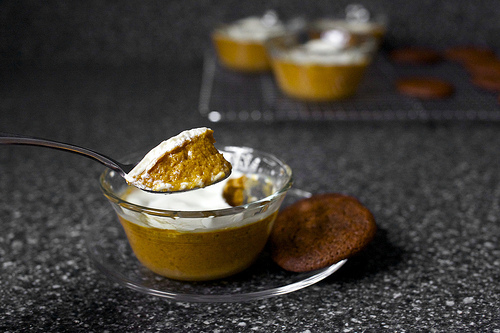 For creamier, silkier pudding: Combine pumpkin, sugar, salt and spices in a food processor and blend for 30 seconds. Transfer to a saucepan and heat over medium-high. Once glurping and simmering in the pot, cook for another 5 minutes, stirring frequently. The mixture will thicken and get a bit darker. Reduce heat slightly and whisk in milk and cream. Off the heat, slowly whisk in eggs. Both methods: Divide between 7 to 8 (I had just shy of enough to make eight 1/2-cup puddings) ovenproof 6-ounce pudding cups or ramekins on a baking sheet. Bake for 35 to 40 minutes, until puddings barely jiggle when shimmied and/or a knife tip inserted into the center of puddings comes out clean. Try not to overbake. While they bake, combine topping ingredients in a small bowl. When the puddings are cooked through, transfer to a cooling rack on the counter and leave oven on. Spoon 2 tablespoons of sour cream mixture onto first pudding and use a small offset spatula, butter knife or spoon to quickly (it will get melty fast) spread it over the top of the first pudding. Repeat with remaining puddings. Return puddings to oven for 5 more minutes, then cool completely at room temperature, about 1 to 2 hours. Chill until ready to serve. Eat with a gingersnap.